This great bundle takes the baseline MC732 XL5+ Power Bender and adds even more capability to make this not only a universal metal bender but an indispensable and versatile bit of fabrication equipment and/or comprehensive wrought iron workers machine. 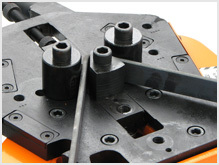 As well as being a metal bending tool, a guillotine for metal, a bar roller, a hole punch and a cold riveting tool, the extra options provide a sturdy floor mount pedestal, attachments for embossing and end forging of bars, an edge bender to bend steel on edge, a micro bender for tight and intricate bends. Last but not least there is an option pack for rolling round tube and rod. 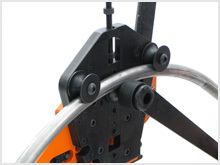 For the money, you will be hard pressed to find a piece of fabrication equipment that is so versatile. TO GIVE YOU 5+ BASIC FUNCTIONS PLUS ALL THE OPTIONAL EXTRA 5 FUNCTIONS FOR AN AMAZINGLY LOW PRICE! To allow for use in horizontal or upright positions. 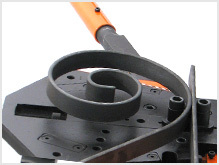 Tools are supplied complete with operating instructions and spare parts lists. 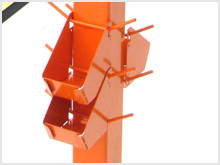 Please note: The maximum working capacity stated is for Hot Rolled Mild Steel Bar and Annealed Bright Mild Steel Bar. Working beyond these limits or with material of greater hardness may reduce the operational life of the machines. TO SEE THE INCREDIBLE CAPABILITY OF THIS TOOL AND ALL OF IT'S OPTION PACKS TAKE A LOOK AT THE VIDEO PLAYLIST ON MC732 XL5 POWER BENDER PRODUCT PAGE AND THEN YOU CAN SEE VIDEO CLIPS OF EACH OF THE OPTIONS ON THE RESPECTIVE OPTION PACK PRODUCT PAGES FOR MC733 (PEDESTAL), MC738 (EMBOSSING & END FORGING), MC736 (EDGE BENDING), MC737 (TUBE/ROD ROLLING) AND MC734 (MICRO BENDING). 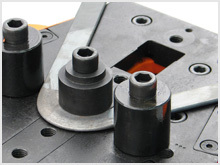 Packs a mean punch with a reversible punch block capable of 5mm and 6mm dia holes in 5mm/6mm flat bar respectively. 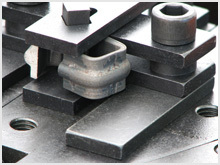 Now includes for 2017 the 3mm and 4mm punch block and pins. Cuts like a hot knife through butter for all of these sizes. Note the separate blade aperture for cutting round and square bar. Produces strong authentic looking ornamental joints using cold rivets. A useful alternative to welding when availability of welding equipment or power is an issue. Real power bending completed in a single pull of a lever. 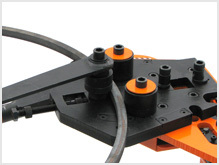 Bends upto 60° angles in material sizes up to 12mm thick. Bends upto 90° angles in material beyond 12mm and upto 16mm thick. An extra feature for gradual bending of even bigger sections into curves. 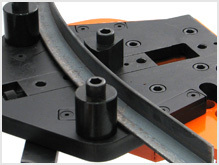 Carried out by applying large bending power at increments along the length of a bar. Handles a wide variety of sections including angle, T-section, square tube, square bar and channel, and even handrail profile. 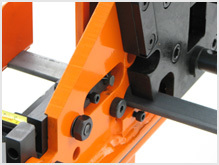 A strong and stable platform that bolts to a solid floor for optimum use of the tool compared to bench mounting. Allows all round accessibility. Supplied with two hooks on bins to keep essential components close at hand. Embossing provides a patterned decorative edge to your steel bars and tube. This is carried out cold using a pair of forge blocks (provided) which give you the option of producing "scalloped" or "nicks" embossed patterns. bars. However, this function requires the ends of the bars to be preheated and tapered. 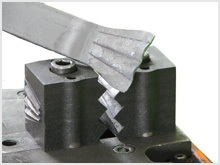 A large and small crimp pattern is provided for larger and smaller bars. 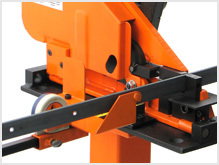 This simple but effective special bending pillar allows gradual and sharp angles in flat bar to be bent on edge. This is such a useful feature when making frames and components out of flat bar. and rod. The five sets enable you to work with tube and rod covering the following sizes: 13mm, 16mm, 20mm, 22mm and an impressive 25mm. A clever little extra kit that allows you to form tight bends. 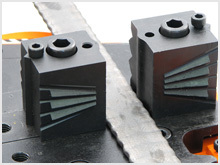 It is really handy for producing decorative collars around joints and scrollwork using special profile material.